Our Deli Department makes an enormous assortment of hot and cold food items fresh daily. We offer many main dishes and side dishes, plate lunches, cold salads, and sandwiches. We bake a large variety of pastries, and breads for meals or sandwiches. 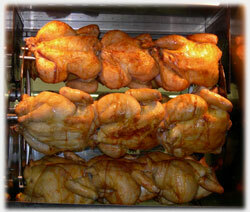 Our Rotisserie cooks fresh chickens and other meats daily. Below you will find a listing of just some of the items we offer, we make too many to list them all here!